Timur’s friend Zeki arrives full of annoying “naive dogmatism“. 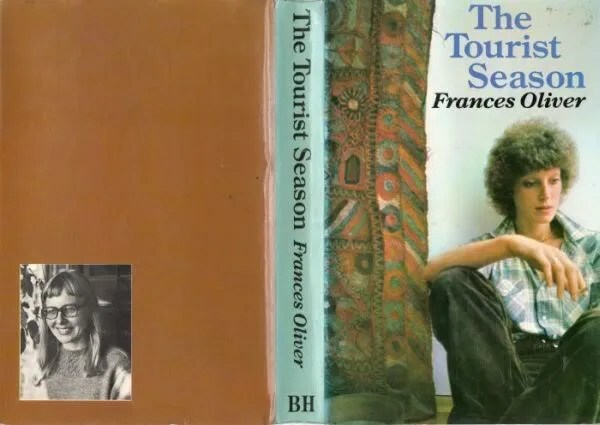 Let me say that the title’s ‘Tourist Season’ is when vacationers arrive in the otherwise off-the-beaten-track village … as I feel we all have yesterday and today in this novel … the Reader Season? (6 June 10). Architectural artefacts as hoax or genuinely filling the ground. Zeki – rumbustious Russian spy? In 1978, that was always a possibility I suppose. Making a subtle sexual pass akin to fishing…? The atmosphere of passion, artistic rivalries, sexual connections of varying permutations, anger, infiltration by races and religions, violence … forgiveness. I wonder whither we go? Wondering whither I go, I let myself float upon the hot seas of this novel. Floating in hot seas being something I would never do in real life. I wonder if, as a new reader visiting the novel, I have diverted its destined path? Not part of the village’s ‘tourist season’ as such (they are brought here by a village contact), a hoity-toity couple arrive, Paula and Herbert Bromberg – with cinematic exposition … followed by a real Turkish picture show film that villagers and Sarah attend with nuances of reaction – and Sarah becomes romantically embroiled and meets the young man’s family. I continue to float and enjoy the emerging potentialities of plot, both comfortable and worrying by turns. But I promised not to re-tell the plot. It is enough for me to know and for you to find out. “The thick coffee grounds looked like Rohrschach patterns, but ones in which I could discern nothing.” (7 June 10 – four hours later). A new leit-motif thrown into the pond of plot, a character called Ramona, with mixed sexuality, collecting Turkish folk-songs on her tape-recorder she christened ‘Caruso’ amid the butchered-meat festival of ‘Kurban Bayram’. She is not one of the tourists but a catalyst between Sarah and Sarah’s? But at the end of the day we are all meat, no doubt. Only by reading fiction we can make ourselves something more. Here a Muslim God? Sarah has returned for her coda, as Frances Oliver types away at the story in her room pretending it’s not a great novel at all but ‘scrambled Shakespeare’ from ‘Children of Epiphany’. A yearning to go into the wilds (with a ‘brother’ like Hansel from ‘The Peacock’s Eye’?) for ancient stones and experiences like the protagonist in ‘Xargos’… Remarkable that ‘turistik’ resonates with ‘Turkish’…. Having now read further, it is not so much a tailing-off or coda, as it turns out, but more a brutal journey-into-catharsis akin to the last song of Mahler’s ‘Das Lied Von der Erde’ if there is an equivalent song to be recorded by ‘Caruso’ from the songs of Turkey. The drumming of hooves as a demon is slaughtered. And we are left with an open-ended crisis or a tailing-off, whichever we choose. Sarah’s ‘I’ is still a mystery to me and I fail to know whether or not to trust her.